WM Dolls is a Chinese brand associated with the ZhongShan ShaXi JinSan Clothing props factory models (aka Zhongshan Shaxi City Jinsan garment mannequin factory). Most WM Dolls products are not available for the independent PQC quality check in Chongqing. The WM-168/A is the second tallest TPE love doll by WM Dolls. She has a body height of about 168 cm, but still doesnt weight more than ca. 28 kg. The doll is made of TPE. This slim female doll has body measurements of 68 cm (breast) x 53 cm (waist) x 71 cm (hips). The WM-160/D is a life-sized TPE love doll with a body height of about 160 cm (63 inches) by WM Dolls. Body measurements: 31.9″ (bust), 23.6″ (waist), 38.6″ (hips) / Weight: 86 lbs. Lots of attributes may be customized; for example, you can select different skin tones, eye colors, and hair colors - just as you are used from WM Dolls. The WM-158/A is a TPE love doll by WM Dolls. The doll has a body height of about 4ft 11′ (~150 cm) and weights ca. 28 kg (with head) respectively 26 (without head; according to the manufacturer's specification). Body measurements: 63 cm (bust) × 60 cm (under bust) × 52.5 cm (waist) × 78 cm (hips) / 92 cm (legs) / 63 (arms) / 33 cm (shoulder) / 26 cm (calf circumference) / 20 cm (ankle circumference) / 12 cm (wrist circumference) / 20.5 cm (foot length). The WM-157/B aka Ulva is a life-sized TPE love doll by WM Dolls. The slim female doll has a body height of ca. 157 cm (5'2 ft) and weights about 28 kg (62 lbs; manufacturer specs). Body measurements: 67 cm / 26" × 48 cm / 19" × 77 cm / 30" (B×W×H). The WM-155 aka Shannon is a medium-sized TPE love doll manufactured by WM Dolls, introduced in September 2015. This doll features a body size of 155 cm (61″) and a weight of 28 kg (66 lbs). Her body measurements are 83 cm/32.7″ (breasts) x 40 cm/15.7″ (waist) x 75 cm/28″ (hips). Lots of attributes may be customized; for example, you can select diffent skin tones, eye colors, and hair colors - just like you are used from WM Dolls. WM-152 is a medium-sized TPE love doll by WM Doll. The WM-152 has a body height of about 152 cm and weights ca. 37 kg. Body measurements: 85.5 cm / 28'7" (breasts) x 53.0 cm / 22'8" (waist) x 92.5 cm / 31'1" (hips). Lots of attributes may be customized individually; for example, you can select different skin tones, eye colors, and hair colors - just like you are used from other TPE love dolls. The WM-140 aka Angel Doll is a female TPE love doll by WM Dolls. This doll's body measurements are located in between WM Dolls 145 and WM Dolls 135. Because of her rather small size of about 140 cm she weights only 23 kg. Body measurements: 72,5 (breast) × 51 cm (waist) × 74 cm (hips). Anime is a female Anime/Manga head by WM Dolls. It fits on the 65 cm Doll which was introduced in November 2014. Closed Eyes is a female head by WM Dolls. The head fits on the 65 cm doll which was introduced in November 2014. This head has closed eyelids and shows a sleeping expression. Lovely is a female head by WM Doll. The head fits on the 65 cm doll which was introduced in November 2014. Model No. 17 is a female head by WM Dolls. The head is made of TPE. Head No. 36 aka Angel (Jinshan no. 36) is a a female head by WM Dolls. The head is made of TPE. 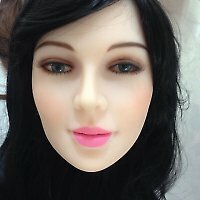 Many attributes of this head can be individually customized; for example, you can configure as well the skin tone, as the eye and the hair color. Head No. 38 (Jinshan no. 38) is a female head by WM Dolls. The head is made of TPE. Model S8 is a female head by WM Dolls which fits to 65 cm mini love doll. The head is made of TPE. Kopf Nr. 59 aka Angel II (Jinshan no. 59) is a female head by WM Dolls. It is made of TPE and features closed eyes. Model No. 64 aka Nava (Jinsan no. 64) is a female head by WM Dolls. The head is made of TPE. Many attributes of the Nava head can be customized individually; for example, the skin tone, the eye color, and the hair color is configurable. The Torso by WM Dolls comes with a head connector allowing to exchange the head. With this torso, you can enter the world of life-like TPE love dolls for a small price and later upgrade to a full doll body - and even re-use the head. This torso has a height of 82 cm (without head) resp. 63 cm (with head) and weights about 17 kg (manufacturer specs).